I recently had two experiences that drove home the need for universal (accessible) design. The first was spending time with my 85-year-old mother at a beach house in North Carolina. She is amazingly spry for a woman of her age, but nevertheless, mobility can be a challenge. The house we rented at first glance was well-equipped with railings and safety features, but upon helping my mom down the steps she encountered railings at uneven and changing heights and not enough room between the wall and rail to get a good grasp. A fall for an elderly person can be devastating and a life-changing experience; many never fully recover. So, it was terrifying each time we left the house. Little things can make a big difference. I also was made very aware that for many, ramps are much easier to negotiate than steps. As able-bodied people we tend to think of ramps as solely for wheelchairs and baby carriages but for the elderly and anyone with mobility issues, a ramp is usually much safer and less exhausting to climb. Stable walking surfaces cannot be taken for granted. 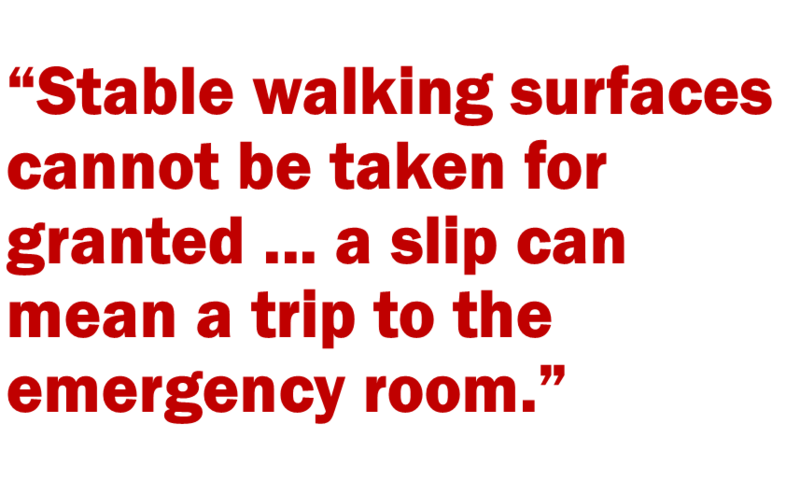 Gravel, heaved pavers, bricks, cobbles, settled concrete walks, all are a challenge to negotiate and a slip can mean a trip to the emergency room. In addition, stamina in the elderly is greatly diminished. Those lovely benches that we show on site plans and specify now become a necessity when walking for any distance or duration as frequent rest stops are required. My second experience was more personal. A bout with kidney stones had me on the way to the emergency room. Getting to the car and into the doctor’s exam room was extremely uncomfortable. I could not walk 20 yards without resting and even lifting my feet beyond a shuffle was difficult. Stepping over a curb was like climbing a mountain and steps were almost insurmountable. In that short walk I found myself nervously scanning the route ahead for anything that might impede my progress or worse, lay me flat out on the ground. As my friend Bill DeMaio (Newington Parks Superintendent) often says, if we live long enough, each of us will experience mobility challenges in our lifetime. As landscape architects and planners, we have the ability to make the world a bit more accommodating for everyone, not just the young and spry. A sloped walk or ramp should begin at the bottom of a set of steps and end at the top, so that a user is not inconvenienced. Accessible parking spaces should be as close to the building entrance as possible. Walking with a mobility or visually impaired person is a challenge in any area, but walking through a busy parking lot where it’s not unusual to have to avoid vehicles is dangerous. Accessible routes should be constructed with a firm, stable material that will not heave or be displaced (not pavers!). Some materials meet the standard for an accessible surface (firm, stable) when constructed but require a lot of maintenance to continue to be accessible over time. Stone dust walks, brick/paver plazas, and wood fiber playground surfacing certainly fall into this category. Wheelchair spaces are required adjacent to benches and must have a clear, flat area. Best practices for benches are that they have a back and arms so that physically challenged individuals can easily sit and stand from a seated position. If a drainage structure falls within an accessible path then the openings in the metal grate can be no larger than one half inch in width. Any dropoff area must also have a designated passenger loading zone that is striped and is accessed via a curb ramp. Tables must have a wheelchair space free of seating, so that a person in a wheelchair can access the table. At least one accessible parking space on a site must be a van-accessible space. In other words, if only one space is required, it must be a van accessible space. All accessible paths and parking areas must have a clear vertical clearance of 98 inches. Good intentions are one thing but reality can be quite different. With site accessibility we are typically dealing with concrete, asphalt, and other crude bulk materials. Often the greater challenge is insuring that the intent of the plans can be carried out. For instance, an accessible parking space has a maximum slope of 5 inches over 20 feet. This is almost imperceivable to the eye and not easy for a site contractor to achieve especially with asphalt (which is why more designers are specifying concrete). At this point there is no waiver for a slightly non-complying surface. It has to be removed and reconstructed, usually at great expense. Universal design has made great strides in the 27 years since the passing of the Americans with Disabilities Act (ADA). It is up to us as designers to make sure that sites comply with not only the requirements but the intent as well. With Smart Levels, which can easily check the slope of a ramp, parking space etc., advocacy groups often review a completed site. We are increasingly being held accountable and rightly so. Thankfully the days of accessibility being considered a luxury are long gone and the needs of our mobility-challenged friends, neighbors, and colleagues are being addressed. Phil Barlow, ASLA is the founder and Principal of To Design. He is a licensed landscape architect and certified planner, and serves as the Chair of the Connecticut State Board of Landscape Architects. To Design is a full-service landscape architecture, urban design, and land planning firm based in New Britain. This piece first appeared in the Winter 2019 edition of Connecticut Planning, a publication of the Connecticut Chapter of the American Planning Association.